APCu is a user database cache that PrestaShop can utilize to increase your site’s speed by caching database data. One thing to note, is that APC is no longer maintained and APCu is a different caching extension. APC used to cache Opcode and database data, but Opcache by Zend came out and did away with APC, it was never upgraded to PHP 5.5 or later. APCu is all of the database caching mechanisms that were stripped out of the APC module. This means that APCu was designed to work alongside Opcache to provide even better performance. If you do not have the APCu PHP module installed on your server you cannot use this module. Ask your host if you are unsure about it being installed, most can install it. It is worth getting installed so you can reap the benefits of having database queries returned from PHP’s memory alongside the Opcache compiled memory. When you install the module it will look like the image below. Click the configure button and you will be taken to the main interface. 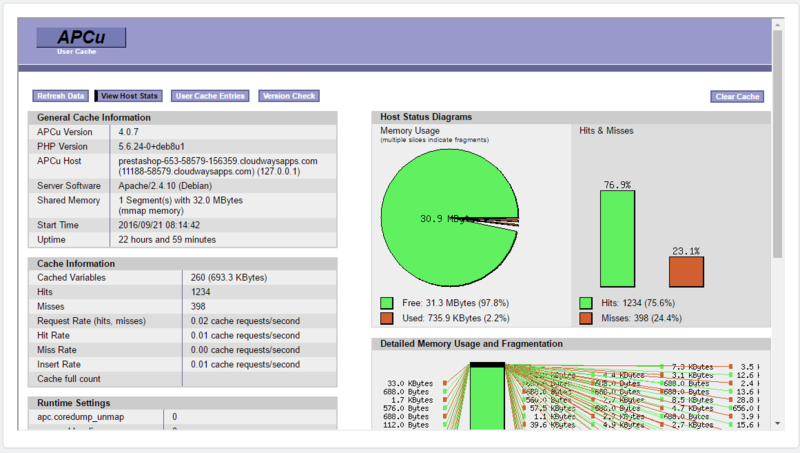 From this interface you can see your current memory usage, how long your cache has been up, and even clear your APCu cache. The main interface will look like the image below. To enable APCu’s usage in PrestaShop you will need to go to the Advanced Parameters and Performance tab. From here you can select to enable APC. Even though it does not say APCu, enabling it will do what you want. The interface of PrestaShop was just never updated to reflect the change. This module will allow you to manage, clear, and view your APCu cache from your back office. It will allow you to see the statistics of your cache so you can tune it for highest performance. To install this module, simply upload the module from the modules page in the back office of your PrestaShop installation. Once it is uploaded you will be able to install the module to view the cache manager.